Open a web browser and type in the camera’s IP address on the Address bar. The default IP address is 192.168.1.115. Enter the Username and Password when prompted for authentication. Ensure that the correct information is entered then click OK. NOTE: The default User Name and Password is admin. Once the main page appears, select Setup and click Image. 1. Resolution - Select the desired video resolution setting. Supported resolutions are 320 x 240 and 160 x 128. The default resolution is set to 320 x 240. 2. Image Quality - Select the desired image quality. The default Image Quality is set to Normal. Higher image quality requires more bandwidth. 1. Color Balance - Select the suitable white balance option you desired. 2. Exposure - If necessary, you can adjust the exposure to obtain a better image. You can select a sharpness value between -3 and 3. 3. Sharpness - Select the desired option for the sharpness. You can select a sharpness value between -3 and 3. 1. Enable Image Rotation- Enable this feature if you want to rotate the image 180 degrees. 2. Enable Time Stamp - If you want to display a time stamp on the video, enable this feature by checking the check box. 3. Enable Text Display - If you want to display text on the video, enable this feature by checking the check box. The text can be up to 20 characters in length. This feature is often used to identify the camera location when multiple cameras are installed. NOTE: If you are using WVC54GCA, your settings should look like the following screen. 1. Resolution - Select the desired video resolution setting. Supported resolutions are 640 x 480, 320 x 240 and 160 x 128. The default resolution is set to 320 x 240. 2. 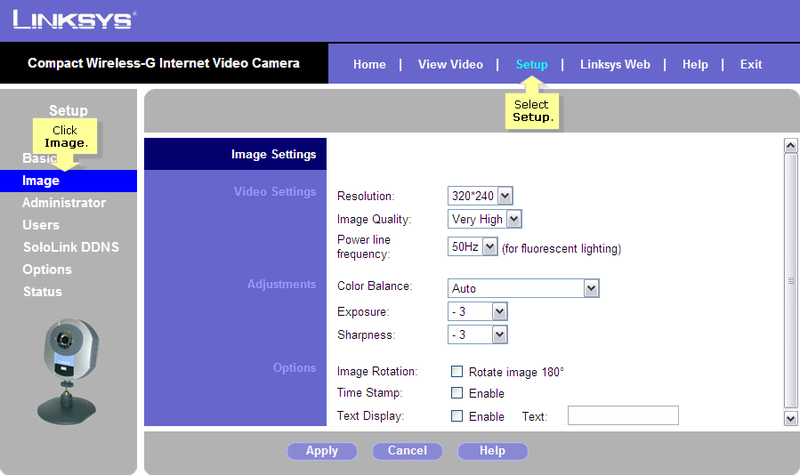 Video Quality Control - Select the desired video quality. The default Fixed Quality is set to Normal. Higher image quality requires more bandwidth. Other options are very high, high, low and very low. 3. Max Frame Rate - Select the desired maximum frame rate. The default maximum frame rate is set to 30 fps. NOTE: Higher frame rate requires more bandwidth. 2. Fixed Quality - The default Fixed Quality is set to Normal. Higher image quality requires more bandwidth. Other options are very high, high, low and very low. 1. Enable Mobile Streaming - Enable video streaming for the mobile device by checking this checkbox. 2. Resolution - The default resolution is set to 160x120. Constant Bit Rate: Select the desired fix bit rate. The default bit rate is set to 32 Kb ps. Fix Quality: Select the desired fix quality. The default fix quality is set to Normal. NOTE: Higher image quality requires more bandwidth. 4. Max Frame Rate - Select the desired maximum frame rate. The default maximum frame rate is set to 15 fps. 5. Access Code - Set up your code for accessing the live video from camera through cell phone connection. 1. Power line frequency - Select the power line frequency (50Hz or 60Hz) used in your region, to improve the picture quality under fluorescent lighting. 2. White Balance - Select the suitable white balance option. 3. Brightness - If necessary, you can adjust the brightness to obtain a better image. You can select a value between -3 and 3. 4. Sharpness - Select the desired option for the sharpness. You can select a sharpness value between -3 and 3. 1. Enable Low Light Sensitivity - Enable Low Light Sensitivity by checking this checkbox. User can get high quality video under low light environment. 2. Enable Microphone - Enable microphone to receive audio by checking this checkbox. Using audio will increase the bandwidth requirements slightly. 3. Time Stamp - Enable this feature by checking the checkbox. This will display the time on the video image. 4. Text Display - If you want text to be displayed on the video image, enable this feature by checking the checkbox. You can enter up to 20 text characters. This feature is often used to identify the camera when multiple cameras are installed.